We’re all familiar with the sight of an ambulance rushing to or parked at the scene of an accident. This does not mean, however, that these vehicles cannot also be involved in collisions. While most ambulance drivers are careful to use their lights and sirens when driving injured passengers and take no unreasonable risks, this is not always true, and the results can be devastating. For instance, a negligent ambulance driver could endanger not only the passengers in the ambulance, but also other motorists in the area if his or her actions result in an accident. Fortunately, those who are injured in accidents that were caused by a negligent ambulance driver, can still hold the at-fault party accountable for damages. However, doing so can be difficult, so if you or a loved one were injured in a collision with an ambulance, it is important to contact an experienced auto accident lawyer who can ensure that your claim is properly filed. How Common are Ambulance Accidents? 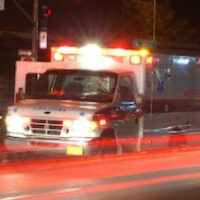 Ambulance accidents occur at a higher rate than most people realize. For instance, according to the National Highway Traffic Safety Administration (NHTSA), as many as 4,500 traffic crashes involving an ambulance occur every year. Around 34 percent, or 1,500 of these collisions result in injuries, most of which (around 46 percent) are suffered by people inside the ambulance at the time of the collision, including EMTs and passengers. Driving through intersections without checking for approaching vehicles. However, driving-related negligent actions are not the only types of acts that could cause injury in the event of collision. For example, failing to properly secure a patient’s gurney to the ambulance’s emergency straps could cause serious injury to an occupant in the event of a collision. Similarly, failing to secure equipment inside the ambulance itself could also open a driver up to liability if that equipment later became dislodged and furthered the patient’s injuries. These injuries are both painful and difficult to treat, so victims are often forced to foot the bill for costly medical expenses and physical therapy while recovering, a task made even more difficult for those who must take time off from work or who now suffer from permanent disability. Fortunately, injured parties can recoup these losses by filing a claim against the negligent driver, or the ambulance company itself if it failed to properly train its employees. Please call 954-566-9919 to speak with one of the dedicated Fort Lauderdale auto accident attorneys at Boone & Davis about your case today.